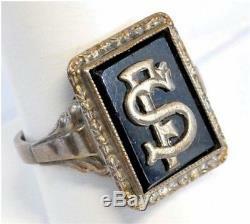 His Personally Owned Monogrammed "FS" Onyx Pinky Ring Guaranteed Authentic. Astonishing intimate piece of Frank Sinatra DNA and History w of the Sorthymithsonian. 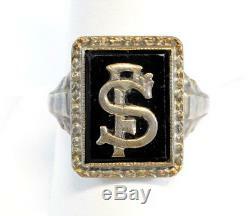 A vintage 1950s era personally owned and worn gold filled onyx ring artistically monogrammed with Mr Sinatra initials FS. This ring was personally gifted to Joe Franklin from Frank Sinatra during one of Joe's visits to Mr Sinatra's penthouse apartment in the famous Waldorf Astoria Hotel. The classic 1945 film "Weekend at the Waldorf" actually has a line mentioning Mr Sinatra's apartment at the famous hotel. We have the ORIGINAL Contract signed by Mr Sinatra giving his permission to use his name in this classic film. Incudes Joe Franklin original signed Certificate of Authenticity on his personal letterhead, detailing how and when he acquired this ring from Mr Sinatra, along with a photo of Joe holding the ring. Countless photos from the 1950s show Mr Sinatra had a penchant for Onyx pinky rings during that time period, just like this one we are offering here. Below are images of him wearing rings very similar if not exactly like this one. Based upon images and personal possessions from his estate and the estate of his best friend Jilly Rizzo, Mr Sinatra also fancied jewelry and cigarette lighters with his initials monogrammed on them. This vintage ornate ring shows extensive wear and uniquely marvelous design, monogrammed FS. We rarely acquire unsigned objects, because unlike autographs, they cannot be authenticated. It all comes down to provenance. So if you know the history of Joe Franklin, you know this is about as good as it gets to being unquestionably authentic. Joe spent over 50 years acquiring personal mementoes and memorabilia from his thousands of his celebrity friends and talk show guests. And he became close friends with Mr Sinatra who would invite Joe to meet him at the hotel. During a couple visits Joe helped Mr Sinatra clean out his Astoria Apartment during which Mr Sinatra gifted several items to Joe including this Ring that Mr Sinatra wore in his younger years. The only guy who remembers more than I do is Joe Franklin, because he's been around longer than me. Joe's showbiz collection is the most outstanding I've ever seen and there's a history behind every single acquisition Regis Philbin. If you are not familiar with Joe Franklin, here are a few highlights. Many up and coming stars from the 1950s to the 1980s got their first mass exposure, first television appearance on The Joe Franklin Show including Woody Allen, Andy Kaufman, Liza Minnelli, Barbra Streisand, Julia Roberts, Bruce Springsteen, Robin Williams, John Belushi and Richard Pryor. 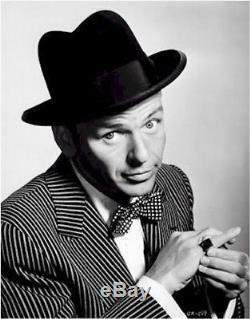 Frank Sinatra reportedly appeared four times. Other Joe Franklin guest claims include John Wayne, Marilyn Monroe (with whom Franklin co-authored "The Marilyn Monroe Story" in 1953), Jayne Mansfield, The Beastie Boys, Cary Grant, Andy Warhol, Salvador Dali, Rudy Vallee, Jimmy Durante, Madonna, John Lennon and Yoko Ono, Bing Crosby, The Belmonts, Elvis Presley, The Ramones, Lou Albano and five US presidents including John F. A&E's documentary It's Only Talk, The Real Story Of America's Talk Shows credits Franklin as the creator of the television talk show. 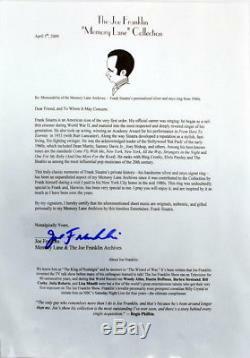 Franklin was listed in the Guinness World Records as the longest running continuous on-air TV talk show host, more than a decade longer than Johnny Carson's run. Franklin's show was first parodied by Billy Crystal during the 19841985 season of Saturday Night Live. Joe was an American radio and television host personality, author and actor from New York City. His television show began in January 1951 on WJZ-TV (later WABC-TV) and moved to WOR-TV (later WWOR-TV) from 1962 to 1993. Joe was called The King of Nostalgia because he was an obsessive collector and was known to ask guest for a piece of memorabilia. His offices including several rooms were cluttered with an endless drove of treasures he collected from the famous. A book written in 1985, Joe Franklin's Show Biz Memorabilia chronicles to Joes massive collection of movie and entertainment memorabilia he acquired directly from his celebrity guests and friends.. Joe Franklin was a national treasure in the talk show and entertainment industry. 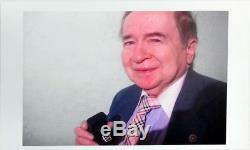 Watching old videos of the Joe Franklin Show I realize Joe may be one of the Best interviewers I've ever seen. Better then Carson, better than Leno or Letterman. Certainly far better than any of the late night hosts today. He was a walking encyclopedia in the entertainment genre. And he never had to read a card... We discussed meeting up in NY City but I procrastinated too long. 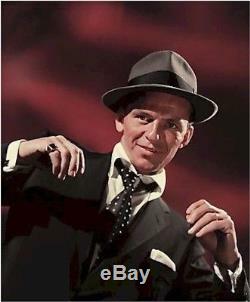 The item "Frank Sinatra His Personally Owned Monogrammed Onyx Pinky Ring Joe Franklin" is in sale since Sunday, January 28, 2018. This item is in the category "Jewelry & Watches\Vintage & Antique Jewelry\Fine\Men's Vintage Fine Jewelry". The seller is "cvtreasures1" and is located in Saint Augustine, Florida. This item can be shipped to United States.